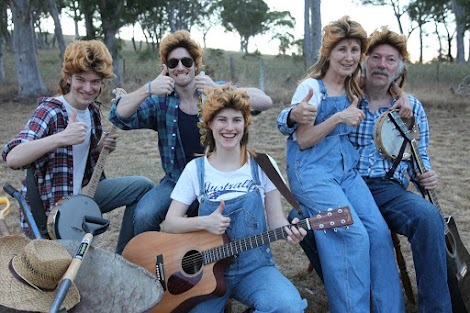 The National Museum of Australia commissioned us to create a special show to be performed twice, at their family fun day for Australia Day, 26-1-2015. 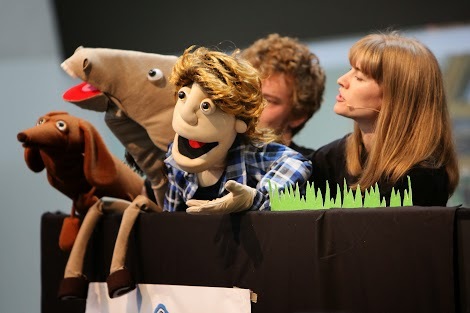 We brought back our characters from our web-series from 2012, Baz ‘n’ Snags, and created a new additional puppet character, Banjo the wild brumby, for the big stage show. Over the day, almost 5,000 people attended! For EVEN more photos, click here for an album of goodies! 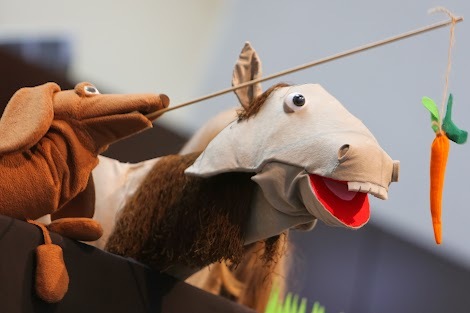 Last week we had two incredible performances of Baz ‘n’ Snags at The National Museum of Australia! Over the day, almost 5,000 people attended! If you missed it, here’s wonderful video made by Cheeky Creek. Wow! 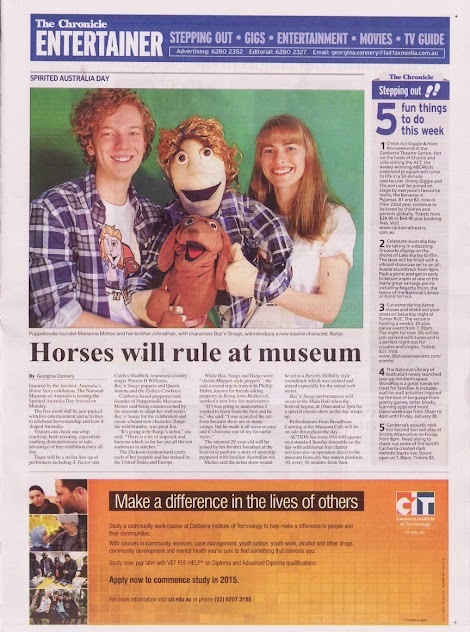 Full page spread in yesterday’s Chronicle! We can’t wait to perform the show! 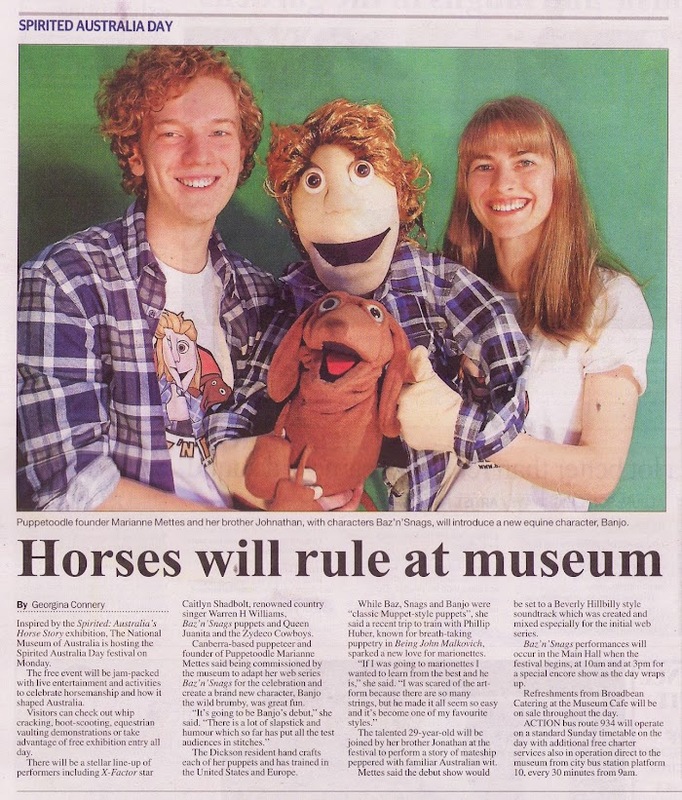 Nice spread in BMA Magazine about our upcoming show at the National Museum of Australia! For the online version of the article, visit the BMA magazine here. 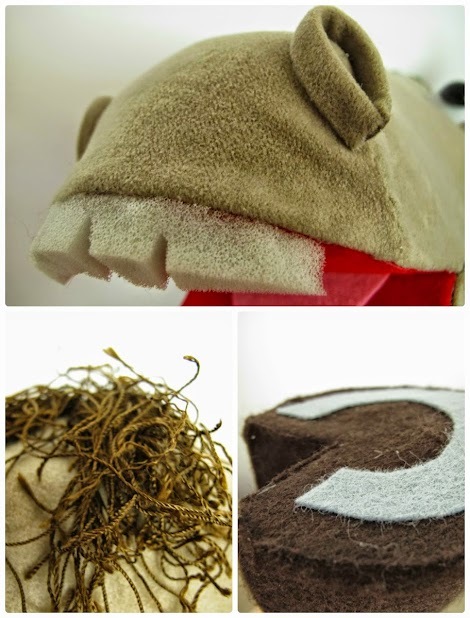 Sneak peak – new puppet for Museum show! We’re getting excited for Australia Day! 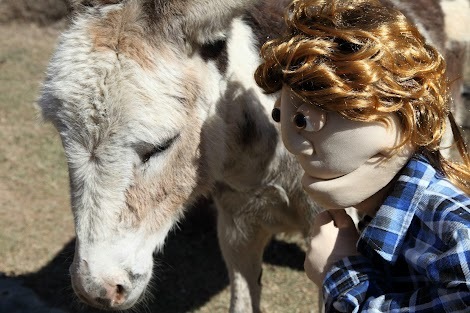 Can you guess our new puppet? Wishing you a a very safe, joyful and loving festive season!! We hope to see you on Australia Day when we perform Baz ‘n’ Snags on the big stage at the The National Museum of Australia! 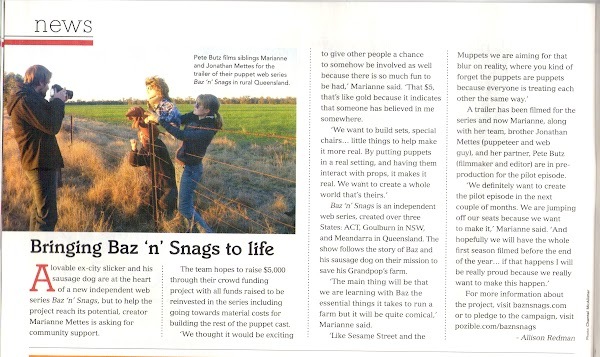 We’re very proud to bring you some little glimpses into the world of Baz ‘n’ Snags! Here are a few videos to show you what our series is going to be like. A very nice interview, written by Allison Redman and photo by Chantel Mcalister. 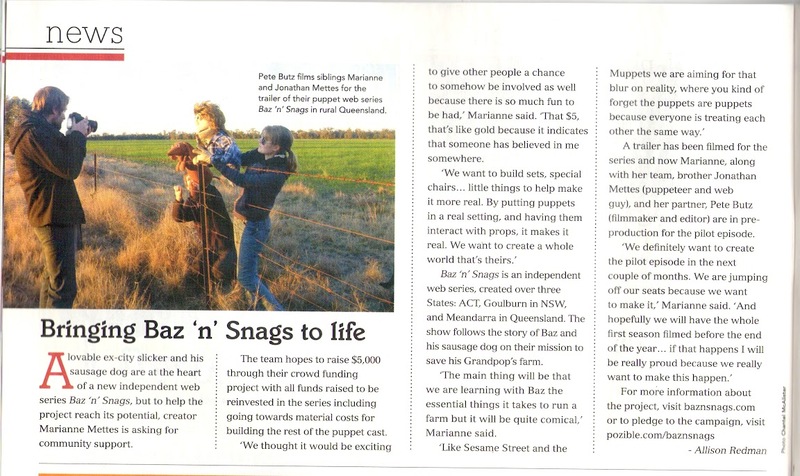 A big thanks to the Canberra Weekly from the whole Baz ‘n’ Snags family! 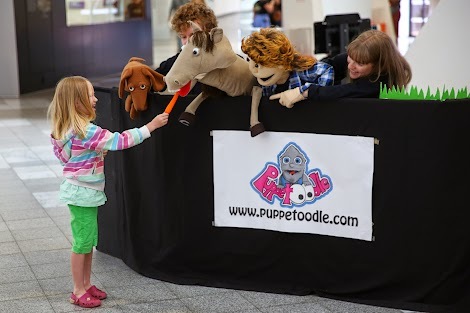 Today was a big day at Baz ‘n’ Snags / PuppetOOdle HQ after we launched our crowd funding project at Pozible! In only a few hours, we already got over $400 in pledges! We are absolutely blown away by your support and faith in our project! However, we are still a long way from our goal of $5,000 so we can make the pilot episode. So please help in any way you can, even if you only have $1 to spare, every little bit helps! Day one of our crowd funding project! 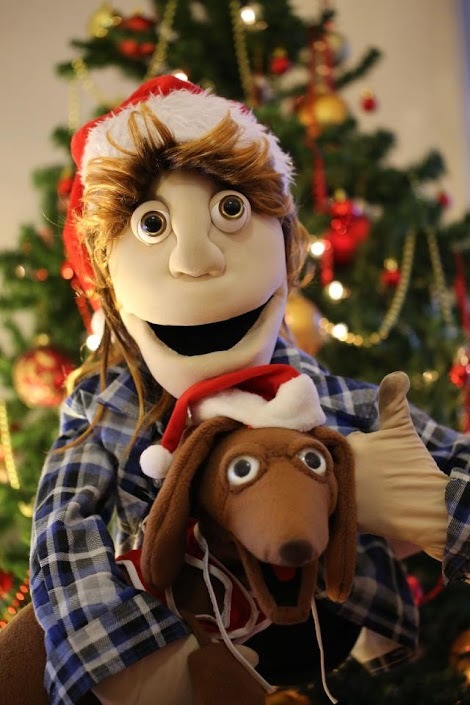 Down at PuppetOOdle HQ, we’ve been working hard writing the theme song to our web series, Baz ‘n’ Snags! 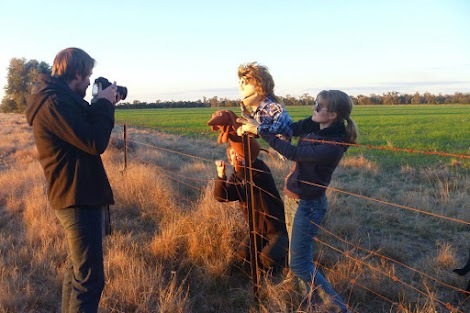 On the weekend, we filmed the music clip! Here’s a little sneak peak at what to expect! Check out all the action on the Baz ‘n’ Snags Facebook page! 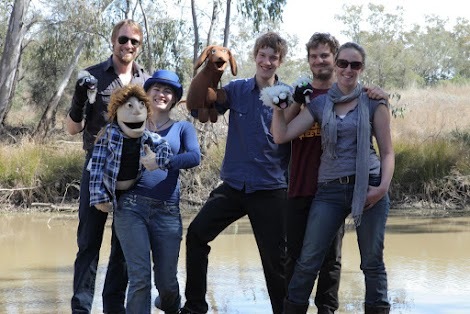 Meet some of our new characters we’ve created for our upcoming web series Baz ‘n’ Snags! 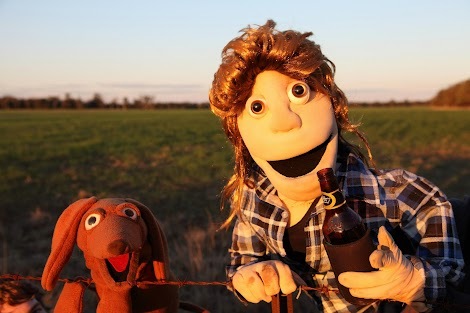 It’s about the adventures of a city bloke and his dog, moving to the Australian country side, to help run his grandfather’s sheep farm. We’ve been filming the trailer of the show and learning all about the life of a sheep farmer, on the beautiful property of our lovely friends Chantel and Jason. We’ll be launching the trailer and lots of goodies in late 2012, along with a crowd funding campaign where you can get involved! The web episodes will be available in 2013. Until then, like our facebook page to see ‘behind the scenes’ footage, trailers, teasers and updates!